You know you’ve been there; stuck in traffic, barely moving, as you watch cars fly by you in the carpool lane. It is so tempting to just sneak over into the other lane isn’t it? After all, you would be going so fast no one would even notice. Well, according to the defensive driving course at DefensiveDriving.com, the carpool lane is restricted to vehicles carrying two or three people (minimums vary by state). If you do not meet this minimum then you risk getting pulled over by the police. Not only will this put you even more behind than if you just stayed in your original lane, you may also find yourself with a fine. Change to: The fines vary from state to state, but are usually in the range of $50-$300. California is the highest with a $490 minimum. That is a steep price to pay for simply saving yourself a few minutes on the road. So I am never allowed to drive in the HOV lane alone? Usually, no you are not. 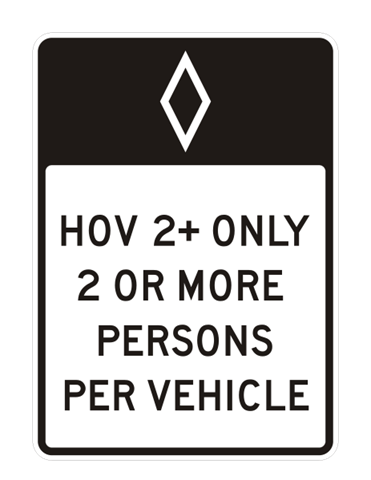 However, some states do offer time restrictions on their HOV lanes, which means that if it is not within these times, anyone can drive in the lane as if it was the same as the other lanes. You may also get lucky enough to drive in an HOV lane if there is a major accident and the traffic is getting redirected, but that situation won’t exactly save you any time. The other situation where you can ride in a carpool lane alone is if you are riding a motorcycle. Motorcycles are always allowed in HOV lanes because it is safer for them to keep moving than it is to stay in stop-and-go traffic. Lucky for you, kids do count as passengers when it comes to carpool lane restrictions. However, they do not count if they are still in your belly. So as long as your kids are riding with you, feel free to ride in the carpool lane all you want. And never feel guilty about it. To sum everything up, HOV lanes are there for a reason; to help motivate drivers to carpool so they can save time during rush-hour traffic. If you don’t follow the guidelines, this benefit will be compromised and you risk getting a hefty fine. As much as sitting in traffic stinks, it is better for everyone.